CASPA allows any electronic file to be attached to any part of a pupil’s assessment record to act as evidence supporting one or more assessment outcomes. Evidence supporting assessments may be of particular use to Inspectors and Advisers in the moderation of assessment outcomes, as well as being of use to teachers and parents in illustrating the progress and attainment of children. The evidence you record for a pupil may be in the form of multi-media files, e.g. digital photographs, scanned items of work, audio clips or video clips, or may be electronic documents, e.g. reports from external agencies, IEPs, etc. Items of evidence that illustrate issues having a broad impact on a child’s development can be associated with every assessment outcome; items of evidence that are more specific can be associated with one or more assessment outcomes. To ensure that evidence is given appropriate weight when it is viewed at a later date, CASPA allows notes about the context in which the evidence was gathered to be recorded to ensure the item of evidence is interpreted correctly. 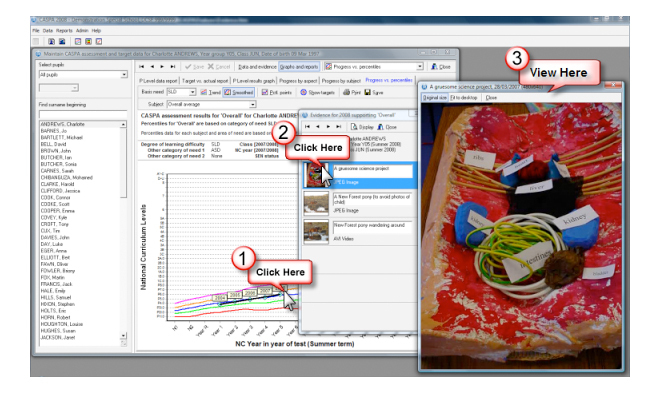 Once evidence has been recorded, it can be viewed in a number of ways; evidence can be viewed via the evidence buttons for each assessment on the main CASPA data screen, and can also be accessed from any of the graphs that display assessment outcomes for individual pupils, as illustrated in the example below. CASPA allows evidence to be recorded for both current and historic assessments, thereby allowing CASPA to build up a set of evidence that provides a clear and unambiguous illustration of the progress made by pupils over time. In the example below, a pupil’s progress is being reviewed (Progress vs percentiles graph). By clicking on the year of interest (step 1) a list of evidence relating to that year is displayed with the contextual notes. Clicking on the thumbnail (step 2) displays the photo, opens a multimedia player to play a short video clip, etc. To capture short snippets of information about pupils that may be relevant to interpreting their progress, CASPA has features to allow the recording of brief notes for pupils, the CASPA equivalent of a ‘post-it’ note. Notes about pupils can be viewed from the notes browser available on the main CASPA data screens. To provide a rounded picture of pupils’ progress, it can be important to provide evidence of their non-curricular achievements and experiences as well as those related to curriculum subjects. CASPA’s additional qualifications facility allows the recording of the additional qualifications and experiences that a pupil may have gained. CASPA is delivered with a set of common types of additional qualification, but these can be added to by the user to allow the recording of any type of additional qualification or experience. When recording details of an additional qualification or experience, you can specify the year it relates to, the type of qualification or experience, a National Qualifications Framework (NQF) Level if relevant, as well as details of the qualification or experience.